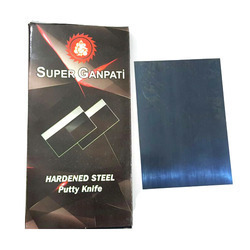 Offering you a complete choice of products which include putty knives and putty blades. We take a huge pleasure in the market by offering best and perfect quality collection of SUPER GANPATI Putty Blades that are available in many sizes and used for smoothening the walls before white washing. Putty knife available in 3", 4", 5", 6", 8", 10" (light) 6", 8", 10" in Heavy Blades and Teeth Blade 6", 8", 10"